And follow the boy wi’ the White Cockade. In 1745, Joseph D’Acre of Kirklinton Hall in Cumbria, was one of His Majesty’s troops defending Carlisle Castle from the approaching Jacobite army. He had left his wife, Catherine and young children in the care of his father-in-law, Sir George Fleming, Bishop of Carlisle, and they were at Fleming’s Cumbrian estate, Rose Castle: Mrs D’Acre was in the late stages of pregnancy and about to be confined. Prince Charles Edward Stuart, wearing a white cockade; William Mosman; National Galleries of Scotland. Bonnie Prince Charlie, Charles Edward Stuart, also known as the Young Pretender, had raised his standard at Glenfinnan in the Highlands on the 19th August 1745 and many of the clans had gathered at his side. The prince claimed the thrones of Scotland and England in the name of his father, James Francis Edward Stuart, the Old Pretender. After taking Edinburgh – although not the castle – and vanquishing the government army at Prestonpans, the Highland army travelled south to invade England. One column reached the strategically important city of Carlisle on the 10th November 1745. They surrounded the city on the 13th and Carlisle Castle surrendered with surprisingly little resistance the next day. The men and garrison were allowed to leave a day or two later, on the condition that they did not bear arms against the bonnie prince’s army for twelve months (or, if they preferred, for a handsome bounty they could agree to be conscripted into the Highland army). A letter to the newspapers, written in the aftermath of the Siege of Carlisle Castle, gave details of the marauding which had taken place in the immediate vicinity. Rose Castle lies a few miles south of Carlisle. On 15th November 1745, with her husband’s fate still in the hands of the Jacobite army, Catherine D’Acre went into labour and was delivered of a baby girl, who she named Rosemary. An hour after the birth, a company of Highlanders, led by a Captain Macdonald, arrived at the gates of Rose Castle, intending to plunder it of the plate and other valuables they had heard lay inside. A servant, old and grey-haired, bravely stopped the Scots and asked them not to venture inside, knowing that the new mother would be alarmed at their presence. Captain Macdonald asked when the lady had been confined and upon being told ‘within this hour’, he halted his men. The servant added, ‘They are just going to christen the infant’. Perhaps Rosemary was sickly at birth to warrant such a hasty, private baptism, hence the extra impetus to keep the troops from the door? Captain Macdonald swept off his bonnet and removed the white cockade from it, presenting the knot of ribbons to the old servant and saying, ‘Let her be christened with this cockade in her cap; it will be her protection now, and after, if any of our stragglers should come this way: we will await the ceremony in silence’. The Highlanders withdrew to the coach-yard where beef, cheese and ale was sent out to them: after eating their fill they left without further disturbing mother and daughter. The White Cockade by John Everett Millais; Wikimedia. The following year, on the 3rd November and shortly before her first birthday, Rosemary was publicly christened in the church at Kirklinton (as Mary D’Acre). Of course, in the first twelve months of Rosemary’s life, the Jacobite army had been defeated at Culloden (on the 16th April 1746), the survivors of that battle vanishing into the Highlands in the hope of outrunning the British troops who were ruthlessly hunting them down. My white cockade was safely preserved, and shewn to me from time to time, always reminding me to respect the Scotch, and the Highlanders in particular. I think I have obeyed the injunction, by spending my life in Scotland, and also by hoping at last to die there. Rosemary, or Molly, as she was known to her friends and family, lived a long and happy life. In December 1777, at the age of 32, she married John Clerk of Penicuik (pronounced Pennycook) in Midlothian, Scotland, an officer in the navy and heir to the baronetcy of Penicuik. Last week at Kirklington, in Cumberland, Capt. Clarke, to Miss Molly Dacre, daughter of Jos. Dacre, of that place, Esq; a young lady whose engaging temper and disposition, cannot fail of securing every wish’d for happiness in the marriage state. In 1817, Rosemary sent an account of the particulars surrounding her birth to the Edinburgh Monthly Magazine, in which they were published. She did so, she wrote, with infinite pleasure, ‘as it reflects great honour on the Highlanders, (to whom I always feel the greatest gratitude,) that at the time when their hearts were set on plunder, the fear of hurting a sick lady and child instantly stopped their intentions’. Portrait of Sir John and Rosemary, Lady Clerk of Penicuik by Henry Raeburn; National Galleries of Ireland. The subject of our first biography, Grace Dalrymple Elliott, was descended from a lowland family who had served in the military during the 1700s. But on which side? To discover more, click here. N.B. Joseph D’Acre was also known as Joseph D’Acre Appleby. The History and Antiquities of Carlisle: with an Account of the Castle, Gentlemen’s Seats and Antiquities in the Vicinity and Biographical Memoirs of Eminent Men Connected with the Locality by Samuel Jefferson, 1838. Today we are honoured to be handing the reins over to a very special guest, the esteemed Dr Jacqueline Riding, art historian. Amongst her many credits she was the research consultant for Mike Leigh’s award-winning film Mr. Turner (2014) and is now working on his next feature film Peterloo. 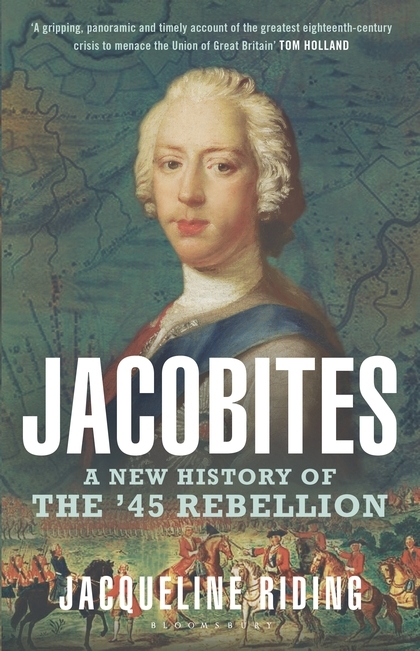 Her book Jacobites: A New History of the ’45 Rebellion has just been released by Bloomsbury Publishing. As a bonus, at the end of her article there is a competition to win a personally signed copy of her beautiful new book. So, without further ado, we’ll leave Jacqueline to tell you more. The recent commemorations for the 270th Anniversary of the Battle of Culloden (16th April 1746), the last battle fought on the British mainland, and the phenomenal success of the TV series Outlander, have certainly brought the 1745 Jacobite Rebellion back into the news, as well as the broader public consciousness. This, in turn, has generated an interest in discovering the history behind Diana Gabaldon’s popular novels (the inspiration for the TV drama). Over the centuries, many books have been written on the ’45 that could be described, broadly speaking, as either pro-Jacobite or pro-Hanoverian: the former vastly outnumbering the latter. But in recent years there has been a desire among established and emerging scholars alike, to present this extraordinary moment in British history in all its complexity, and to place it, correctly, in an international, as well as national and local context. In this spirit, my book, Jacobites, straddles different disciplines, blending military, social, political, court, cultural and art history, and shifts, chapter by chapter, between an international setting, to the national, regional and local: from the battlefields of Flanders and the Palace of Versailles, to the Wynds of Auld Reekie and the taverns of Derby. I also based the narrative, as far as possible, on first person or primary accounts – letters, journals, diaries and newspapers – through which the reader discovers what was known, or believed, by individuals or groups, at the moment the action or event is occurring. Vital to this was the year and a half I spent working on the Stuart and Cumberland Papers, the private papers of the exiled Stuarts and William Augustus, Duke of Cumberland (commander-in-chief of the British army at Culloden), both in the Royal Archives at Windsor Castle. The book’s style is often, therefore, closer to reportage and current affairs, than a retrospective history. In this way I aimed to avoid the overwhelming sense of romantic doom that tends to envelop ‘Bonnie Prince Charlie’ and the ’45, while, hopefully, keeping the reader in the moment: after all, in the years 1745-6, nothing was certain. To whet your appetite, here is a quick introduction to the ’45. 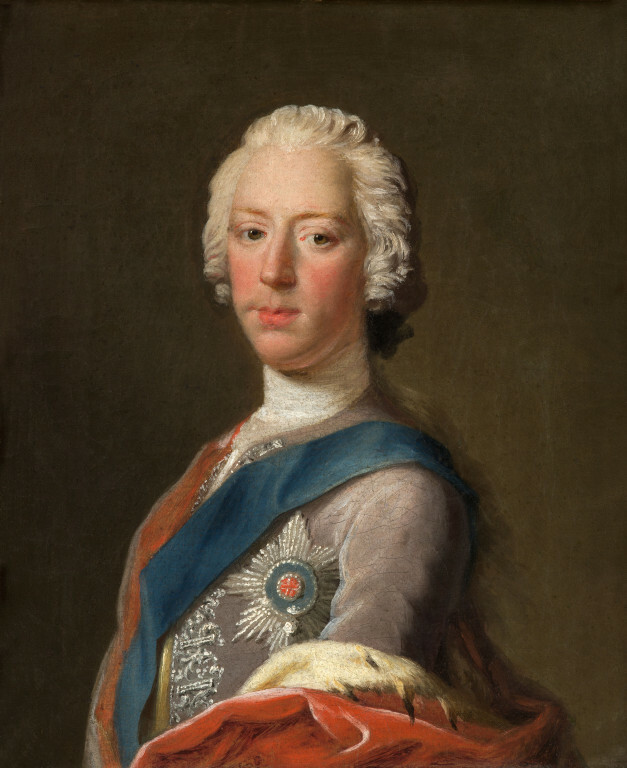 In 1745 Charles Edward Stuart (b.1720) had one key aim: regaining the thrones his grandfather, the Roman Catholic convert James VII of Scotland and II of England and Ireland, had lost in 1688-90 to his protestant nephew and son-in-law William of Orange, who reigned as William III with James’ eldest daughter, Mary II. This ‘Glorious’ Revolution confirmed a Protestant succession in a predominantly protestant Great Britain, which, from 1714, was embodied in the Hanoverian dynasty. 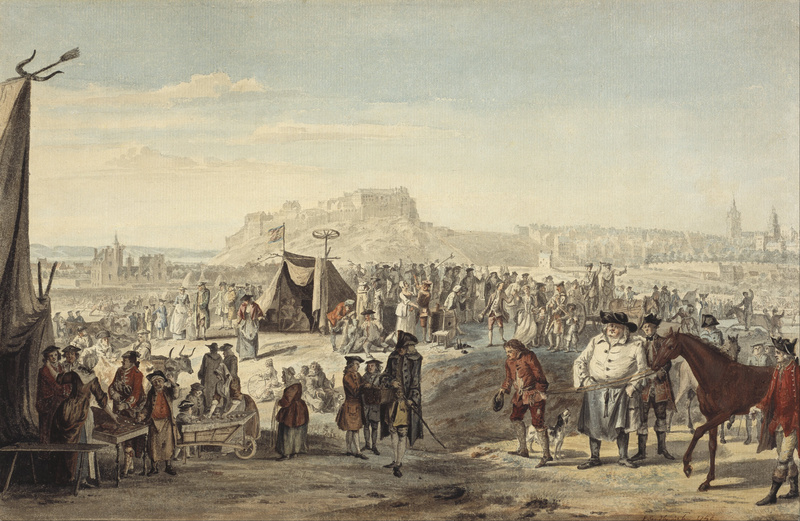 Following George I’s accession, several armed risings in support of the exiled Stuarts occurred, most notably in the years 1715 and 1719, and Jacobite (from the Latin for James ‘Jacobus’) plots continued to plague the new Royal Dynasty. 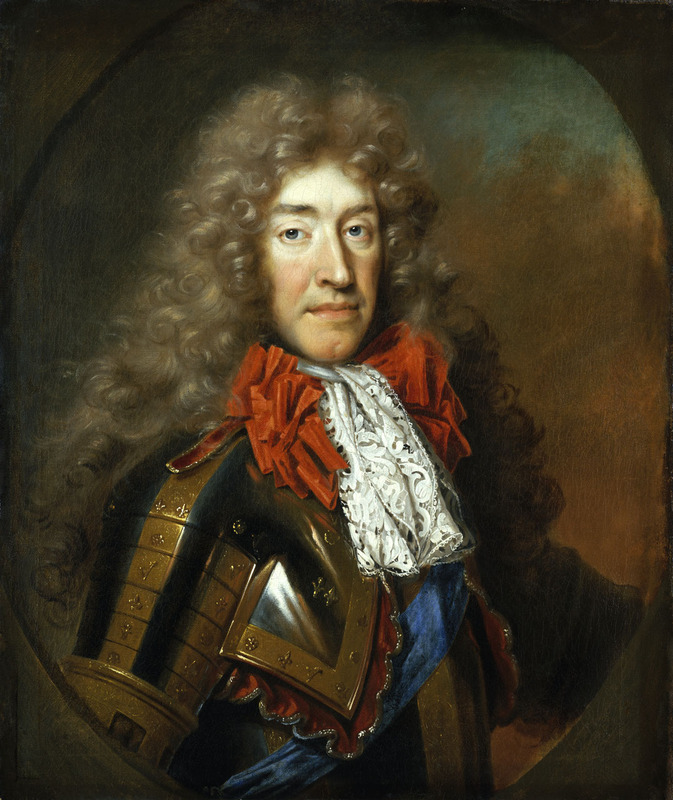 By this stage, on the death of James VII and II in 1701, the chief claimant, the ‘Old Pretender’ (from the French for claimant ‘prétendant’) was his only legitimate son, and father of Charles, James Francis Edward (b.1688). A major French invasion of Britain in support of the Stuarts in early 1744 had been abandoned, mainly due to severe weather, leaving Charles, who had arrived in France to lead the invasion, kicking his heels in Paris. To find out more you will of course need to read the book, but in the meantime here is a chance to win your very own copy. Who is your favourite rebel and why? There is no right or wrong answer and you don’t need to provide your address as we’ll email the lucky winner. The rebel can be from any period of history. Please reply to this post using the ‘Leave a Comment’ at the end of the post. All entries must be received by midnight on Tuesday 17th May 2016. The competition is open to readers in the UK only (prize courtesy of the publisher). THE WINNER HAS BEEN NOTIFIED AND WE WOULD LIKE TO THANK EVERYONE WHO ENTERED. If you’re not our lucky winner but would like to buy a copy of Jacqueline’s book, it can be purchased from Bloomsbury Publishing, Waterstones, Amazon plus many other leading book sellers. 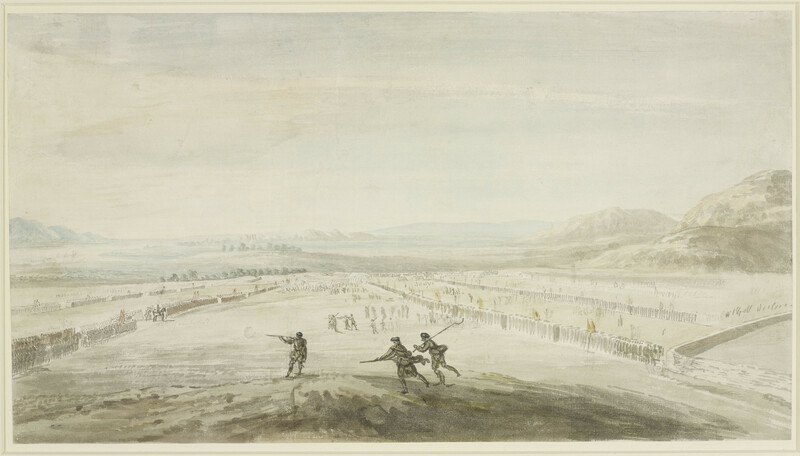 Featured image: The Battle of Culloden; Peel Ross; Highland Council. Constance Bouchier Smith and the grandson of the Young Pretender. As part of our ‘Blog Tour’ we are delighted to have been asked to write a guest post for the wonderful Geri Walton. We have chosen to focus on Grace Dalrymple Elliott’s cousin who was connected to a young lady by the name of Constance Bouchier Smith and we examine her relationship to the grandson of the Young Pretender. Without giving any more away, we will hand you over to Geri to tell more over on her blog ‘Unique histories from the 18th and 19th centuries’ by clicking HERE. Whilst researching our book, An Infamous Mistress: the Life, Loves and Family of the Celebrated Grace Dalrymple Elliott, we came across ‘The Curse of the Nine of Diamonds’, in reference to Grace Dalrymple Elliott’s paternal family. Grace Dalrymple made a ‘marriage-a-la-mode’ to a wealthy doctor in 1771, but it was not a success! Grace was young, tall and beautiful and her husband, Dr John Eliot, was much older, and reputedly much shorter too, than his new wife. The workaholic doctor allowed his wife to be escorted around London by his friends and other young men, while he basked in the reflective glory of having a wife who was desired by many but ‘owned’ by him. When this ran to its obvious conclusion and Grace was discovered at a bagnio with Viscount Valentia, a divorce swiftly followed leaving Grace, although still not legally an adult, to survive on her looks and her wits. And so Grace Dalrymple Elliott (she chose to spell her surname differently from her husband, possibly in defiance to him) became a courtesan, notorious amongst the ranks of the Cyprian Corps. We know that Grace had longed to use the crest of George, 4th Earl of Cholmondeley, one of her lovers but, denied permission to have his arms displayed on the door of her new carriage, Grace instead opted to display those of Dalrymple of Stair instead (although truly not entitled to do so), promoting her aristocratic connection, albeit a distant one, with the then current head of that family, John Dalrymple, 5th Earl of Stair. The heraldic arms of the Dalrymple of Stair family is known as The Nine of Diamonds, a reference to the nine diamond lozenges which are displayed on it. There are numerous theories as to the origins of this curse, but the earliest one we have found dates back to 1708 where it was reported in the British Apollo or Curious Amusements for the Ingenious’, 3rd September. Amongst these theories as to the origin of the curse, the one that appears reasonably plausible concerns John Dalrymple, 1st Earl of Stair, who ordered the massacre at Glencoe (1692). 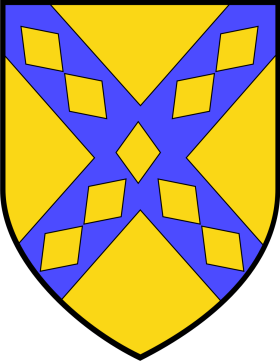 The massacre caused an outcry across Britain and as his family coat of arms contained the nine of diamonds at its centre the card, as a result, assumed this appellation. The Massacre of Glencoe took place on 13 February 1692, when government troops slaughtered 38 members of the Clan MacDonald in their homes. 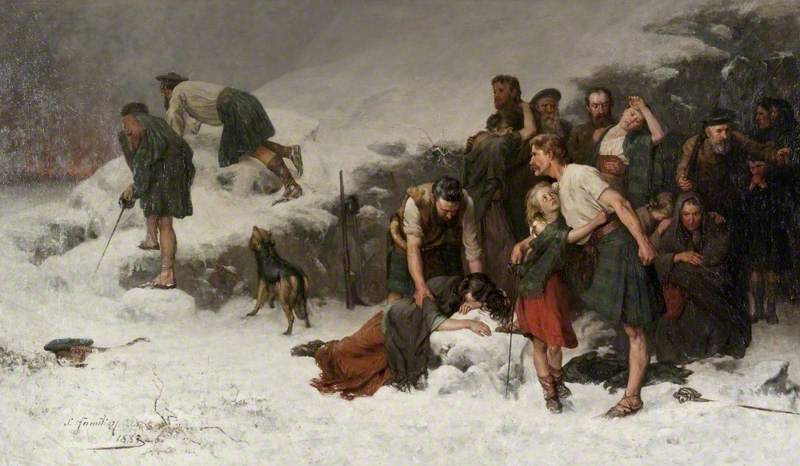 Some survivors managed to avoid the attack, as shown in this later painting, and attempted to escape through the snow. There was also a somewhat later theory which, bearing in mind the above newspaper report, would now appear to be totally implausible. The account stated that it was due to the Duke of Cumberland who, on the evening before the Battle of Culloden in 1746, was playing cards with his staff when a young officer appeared and wanted to know the orders for the battle. 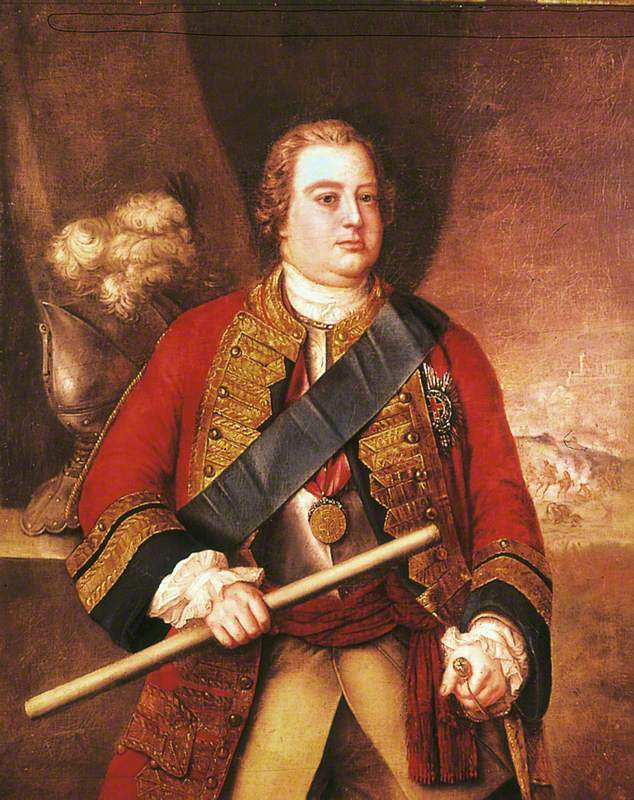 The Duke, it is reputed, ordered “no quarter” to the Jacobites. 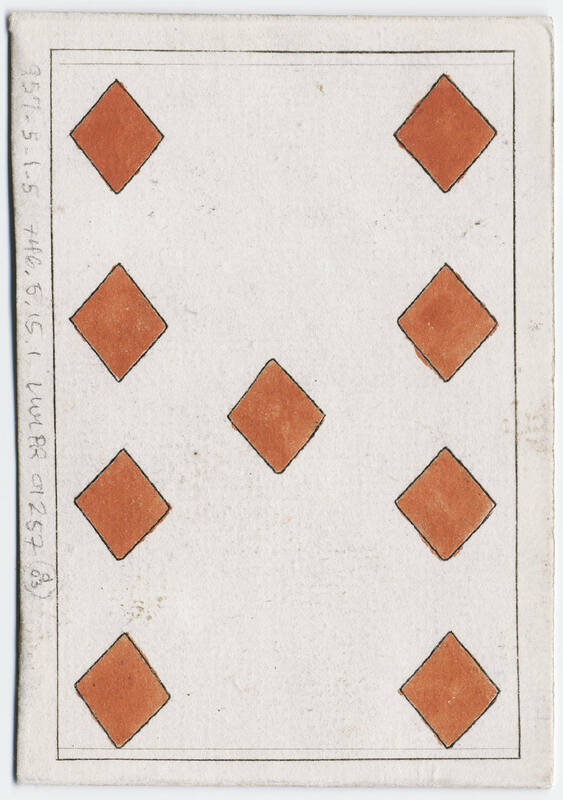 The young man was worried by this possible massacre and asked the Duke to write down the order, he duly obliged and wrote it on the nearest playing card which happened to be a nine of diamonds. This interesting theory we know now is impossible as the ‘curse’ was already in existence. 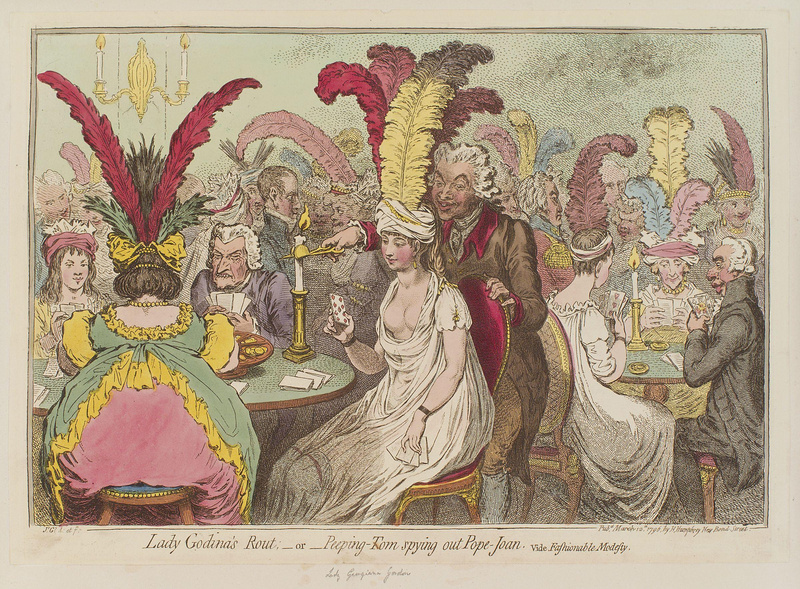 Another suggestion seems to relate ‘Pope Joan’ which was a card gambling game that was played from at least 1732. The nine of diamonds was a significant card and was called the pope. The pope was regarded a villain amongst Scottish reformers and so the nine of diamonds was renamed the curse of Scotland in this game. ‘… the proverbial expression of ‘The Curse of Scotland’ to have taken it’s rise from the Earl of Stair’s (who had a principal hand in the Union) bearing nine diamonds in his coat of arms, and as the Scotch have considered that event as an unfortunate one, and distinguished it as the ‘Bitter Onion’ they have since called the nine of diamonds ‘the Curse of Scotland’. Whatever its true origins it was considered to be the unluckiest card in the pack. Grace would surely have known of these stories, but the distinction of displaying these arms on the door of her coach overcame any associations with a reputed curse. Divorced wife, infamous mistress, prisoner during the French Revolution and the reputed mother of the Prince of Wales’ child, notorious courtesan Grace Dalrymple Elliott lived an amazing life in eighteenth- and early nineteenth-century London and Paris. Strikingly tall and beautiful, later lampooned as ‘Dally the Tall’ in newspaper gossip columns, she left her Scottish roots and convent education behind, to re-invent herself in a ‘marriage a-la-mode’, but before she was even legally an adult she was cast off and forced to survive on just her beauty and wits. The authors of this engaging and, at times, scandalous book intersperse the story of Grace’s tumultuous life with anecdotes of her fascinating family, from those who knew Thomas Jefferson and George Washington, and who helped to abolish slavery, to those who were, like Grace, mistresses of great men. Whilst this book is the most definitive biography of Grace Dalrymple Elliott ever written, it is much more than that; it is Grace’s family history which traces her ancestors from their origin in the Scottish borders, to their move south to London. It follows them to France, America, India, Africa and elsewhere, offering a broad insight into the social history of the Georgian era, comprising the ups and downs, the highs and lows of life at that time. This is the remarkable and detailed story of Grace set, for the first time, in the context of her wider family and told more completely than ever before. Today we are going to direct you to the site of our friend and fellow Pen and Sword Books author, Geri Walton, where you can find a guest blog we have written. Our blog is about Grace Dalrymple Elliott’s sister, Jacintha Dalrymple, and her connection with a Jacobite relic owned by the family of her second husband, Thomas Winckley of Lancashire. So, without further ado, we’ll direct you to Geri’s site by clicking HERE where you can read more about Jacintha and also discover Geri’s site if you have never visited it before. Grace Dalrymple Elliott, as regular readers of this blog will know, is the subject of our forthcoming biography to be published by Pen and Sword Books in January 2016. It is currently available to pre-order at the following sites. Please note: if you are reading this from outside the UK, we are expecting it to be available in America a few months later than the UK publication date, and hopefully elsewhere worldwide too. We will keep you informed and update this page as soon as we have more information.